Passengers on the upper deck of westbound trams passing by Wanchai would recall that the first floor of 48-50 Johnston Road was the home to both the Hong Kong Printers Association (香港印刷業商會, hereafter referred to as “HKPA”) and the Hong Kong Hok Shan Association (香港鶴山同鄉會, hereafter referred to as “HKHSA”) from 1961 until the HKHSA relocated in 2008. The fact that these two groups were housed in the same building is no coincidence as Hok Shan natives have long dominated the local printing industry and the origin of this connection can be traced to one man, Lee Yat-Ngok (李一諤, 1892-1974) the US educated former chief of Hok Shan county (鶴山) who moved to Hong Kong in 1927. His Local Printing Press Co Ltd (樂古印務公司, hereafter referred to as “LPP”) became a leading printer in Hong Kong (the first to be publicly listed) and he hired many of his Hok Shan natives as workers. As the workers branched off to start their own print shops, they brought in more workers from their hometown and the number of Hok Shan natives in the Hong Kong printing industry multiplied to become a dominant force and helped turn Hong Kong into one of the four printing centers in the world. In fact as chairman of both the HKPA and HKHSA, Lee purchased the Wanchai site back in 1957 and came up with the idea of housing both organizations in the same 8 story building which was completed in 1961. Lee was by no means the first commercial printer in Hong Kong as the HK printing industry has had a long history tracing back to the colony’s early years when printing was dominated by Portugese firms such as Noronha & Co (longtime printer of the Hong Kong Government Gazette founded in 1844 which was eventually absorbed by the government) and HK Printing Press (operated by the Xavier family from 1888 to 1980) and at least two other well-known Chinese printers – Sheck Wah Tong (founded in 1911 by Chiu Fu-pui) and Asiatic Lithographic Printing Press (founded in 1915 by Kwan Wai-nung, the “King of Calendar Posters”) were established before LPP. 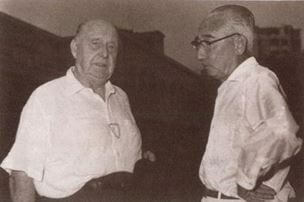 However, Lee was definitely the most influential figure in the industry’s history as the founder (in 1939 and then its post-War restart in 1945) and long-time chairman (12 years in total) of HKPA during which he helped promote worker’s welfare by introducing the first trade group sponsored worker’s compensation scheme in 1954 and also helped establish the first formal vocational training programs for printers, first with the Catholic Church via Caritas and Tang King-po School in the 1950s and 60s and later with the government via the Kwun Tong Technical Institute in 1972. For decades his printing operation was located on Duddell Street in the heart of the Central business district and today, Printing House on Duddell Street serves as a monument to the legacy of this printing industry pioneer. Lee Yat-ngok was born in 1892 in Hok Shan as Lee Oi (李靄) and also had the alias of Lee Shui Yiu (李瑞饒). The eldest of six children, he had three younger brothers and two younger sisters. Hok Shan (Heshan in Mandarin) is one of the five counties in the Jiangmen prefecture in Guangdong collectively known as Ng Yup (五邑, the other four being Xinhui, Taishan, Kaiping and Enping) where large number of villagers immigrated to the United States in the late 19th century and many of them were also involved in financing the revolution that overthrew the Manchu regime. After initial private schooling in Hok Shan, Lee followed his father Lee Kin-sang (李健生) to the United States, where he pursued his studies at an engineering school in Chicago (possibly the Armour Institute, now Illinois Institute of Technology) to learn about machinery. According to a letter he later sent to Sun Yat-sen, Lee chose to study engineering as he saw industrialization as the path to strengthen China. In 1915, he returned to China and started the first mechanical rice processing plant in Hok Shan. In 1917, Sun Yat-sen initiated the first Constitution Protection Movement against the warlords and established a military government in Canton. Impressed by Lee’s technical background and leadership potential, Sun recruited Lee to head the government’s newly created Aviation Department in early 1918 with aviator Chang Wai-jung (張惠長, 1899-1980, who later became chief of the KMT Air Force and Minister to Cuba) as his deputy. Lee discovered two disused aircraft stored by Chinese American pilot Tom Gunn in Dashatou Island on the Pearl River, which he serviced and repaired so that they could be flown. These aircraft, usable for training purposes only, became the nucleus for building the air arm of the KMT as they scoured the market for used aircraft paid for by scraping together their own meager resources as well as by generous donations from supporters among Chinese abroad. Sadly, Lee’s aviation career was short lived as the first Constitution Protection Movement soon failed and he returned to the private sector. However, Lee’s pioneering effort in aviation did not go unrecognized and in 1988 when the government erected a memorial for Cantonese aviation pioneers at the 19th Army Memorial Cemetery in Guangzhou, Lee was amongst the ten names engraved in the memorial, second only to the “father of aviation” Feng Yu and the Air Force also donated a retired Mig-15 fighter jet to the Heshan County Museum in Lee’s honor. 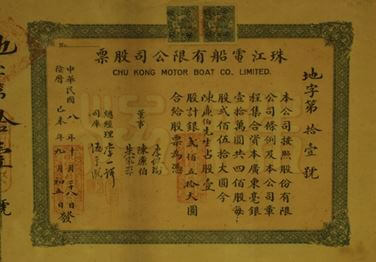 During this period, Lee established the Chu Kong Motor Boat Co (珠江電船) for which he served as its managing director and allegedly designed some of its boats. According to US consular reports in 1921, the firm was a “principal manufacturer of launch and motorboats in Canton” along with Hip Tung Wo (協同和) and Kwan Wo On (均和安) and one of their recently constructed boats was “capable of the speed of approximately 30 miles per hour”. The firm was also granted a license to operate motorboat ferries between Canton and Honam and one of its directors was the controversial HSBC comprador and Canton business leader Chan Lim-pak. In 1921, county chief elections were held across the Guangdong province under the rule of General Chen Jiongming. With the overwhelming support of his fellow villagers, Lee became the first elected county chief of Hok Shan. During his administration, he launched a staunch campaign against opium and bandits which included closing up opium dens and even arresting his own uncle who was an opium addict. 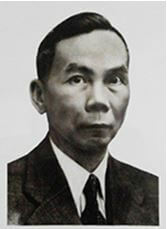 In terms of education, he appointed the renowned Malaysian Chinese educator Song Shen (宋森, 1877-1952) as director of education and successfully replaced the 130 poorly managed traditional private Chinese schools with 40 well organized Western style elementary schools, enrolling over 2000 students including girls for the first time. He also modernized the infrastructure of the county by building roads and installing telephones and electricity. Lee had accomplished so much in his short tenure, when his two years term expired and the Guangdong government ordered him to step down as they abolished the election system across the province, over 3,000 private citizens of Hok Shan took to the streets four times to petition for him to stay. With popular support, he managed to stay in power until May 1924 when he was finally forced by the provincial government to step down. According to his grandson, Lee Yat-ngok had “his fill of corruption blighting China at the time, and so decided to give up everything and start afresh in Hong Kong”. In Hong Kong, Lee leveraged his knowledge of machinery and earnings from his business ventures in the mainland and incorporated The Local Printing Press Limited (LPP) in July 1927. For decades, his printing factory was located at 13 Duddell Street in Central and eventually LPP would ended up owning half of the street with three buildings. Not a lot of information is available about Lee and LPP between 1927 and 1941, Lee himself only appeared on the Jurors List twice in 1939 and 1940 and his address was listed as 514 Nathan Road in Kowloon. Further search in the HK Government Reports database of the name “Local Printing Press” however yielded interesting results as the firm’s name first appeared in 1917 with a Parsee merchant by the name of Maneckshaw Framjee (M.F.) Billimoria listed as manager. Billimoria’s own name first appeared in the 1911 Jurors List where he was listed as working for the historic Parsee firm of Jeejeebhoy & Co. In 1922, LPP was listed as “Indian owned” and was operating out of the basement of the Carlton Hotel Annex (building owned by Parsee merchant H.M. Nemazee) on Duddell Street, right next to the Carlton Hotel (first opened as Carlton House in 1904, then Grand Carlton Hotel in 1908, and in 1922 was operated by Mrs. F. E. Cameron) and the printing operations of Kelly & Walsh, which was the leading book publisher at the time. A very large fire broke out in August that year at the Kelly & Walsh godown which spread quickly and severely damaged all three buildings and operations mentioned above. It is possible that Billimoria sold LPP to Lee in 1927 and in 1929, he was still listed as Secretary of LPP but 4 years later he departed for India in 1933. BW Bradbury (left) and Joe Landolt at the Craigengower Cricket Club which he was a major donor for many years. Unlike other Chinese printers at the time which focused on Chinese clientele, Lee built a highly lucrative and stable business over time by securing large printing contracts from large British controlled establishments such as the Jockey Club (lottery tickets), the HK Government (annual reports), banks (cheques), corporations (stock certificates) and hotels (e.g. the silk menus for the Peninsula Hotel’s restaurants). To land these contracts, key connections in the British business community beyond delivering price and quality came into play and Lee found the perfect business partner in Bertram Walter (B. W.) Bradbury (白普理, 1885-1970). A major benefactor of the Craigengower Cricket Club (CCC, of which Billimoria was also a member), Bradbury was well connected to the colonial business elites of his time and his name first became associated with LPP as a director in 1937. Under the leadership of Lee who served as managing director of the firm, business was good in the post War years. In 1949, LPP secured one of its most important contracts and became the official printer for the Jockey Club, printing the latter’s lottery tickets and other materials. It did not hurt that for many years after the War, one of LPP’s directors was the former manager of HK branch of Mercantile Bank, Donovan Benson OBE (1896-1972) who was the chairman of the Jockey Club from 1953 to 1967 and also chairman of Green Island Cement and SCMP and board member of a number of listed companies such as Nanyang Cotton Mills, HK Land and HK Telephone. J.S.C. Neel, the managing director of Green Island Cement and part time jockey who was tragically killed in a racing accident in 1961, was also a director of LPP until 1958. Big contracts plus prudent capital management (e.g. for much of its history, LPP administered its business out of a tiny two-room office in Baskerville House, had pretty much zero debt and owned all of its machinery and properties) led to steady growth in profits and assets in the 1950s. By the fiscal year ending June 1949, the firm earned record sales and profits, with profits at over HK$373,000, a significant increase from the previous year. It acquired more equipment and also hired the architectural firm of Leigh & Orange and the contractor Sui Kee & Co to build the Printing House on 6 Duddell Street. In 1950, profits soared to $647,832 thanks to an increase in rental income and the growth of its core business and HK$50,000 was transferred to set up a superannuation scheme for its employees. It also became a public limited company. 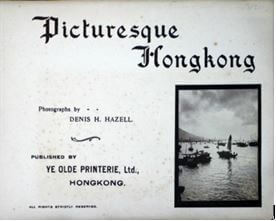 By 1951, LPP was ready to expand and completed two landmark acquisitions: the Hong Kong Dollar Directory and Ye Olde Printerie (義澳印務). The HK Dollar Directory was founded in 1916 by J. R. Flynn Anderson and its business model was not unlike today’s Google – provide a comprehensive information directory for low/no cost (or in the Dollar Directory’s case, one Hong Kong dollar) and make money from corporate advertisers. 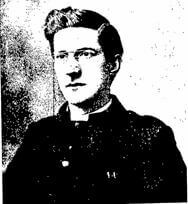 Anderson was a globetrotting marketer who once served as an army chaplain in Africa during the Boer War and then made some money conducting lectures in countries such as Australia, New Zealand and India about his Zulu campaign experience which he used to start the first English newspaper in Cebu, Philippines – The Cebu Chronicle. One of his first projects in Cebu was to publish a directory of its 400 foreign residents, which was a precursor of the Dollar Directory idea. After 7 years in the Philippines he moved to Hong Kong where he compiled and published the Dollar Directory, containing information about everything and everyone you needed to know in the colony. It was an instant success and prompted him to launch a Singapore edition in 1918 where he also established the first advertising agency in Malaya. Sadly he was overworked and died of a heart attack in in Singapore in 1919. After Anderson’s death, the Directory became a property of Newspaper Enterprise Ltd, the publisher of the China Mail. By 1929 the Directory was 500 pages and also included a Canton section. In 1934, it called itself “one of the most unique and cheapest directories in the world”. Everyone was urged to submit entries by December 1 and it was also mentioned that some firms bought enough copies to put one on every staff member’s desk. The company also made an effort to have the directory in every home in HK with 1,000 copies being shipped to England through sponsorship by the British Trade Commissioner. The 1941 version included 656 pages and was still for sale for only 1 dollar per copy. Over time the price increased and by 1964 the Directory sold for $1.75. With the advent of Yellow Pages and other information sources, the Dollar Directory became less relevant and was discontinued in the late 1980s. Today, the 70+ volumes of directories provide a panoramic view of Hong Kong society over seven decades. Ye Olde Printerie was and still is a leading high end printer renowned for printing elaborate stationery and invitations and highly praised for the workmanship of its handcrafted products. It also published picture books, printed journals for the Royal Asiatic Society and annual reports for the HK General Chamber of Commerce and produced accounting ledgers, rubber stamps and other stationeries. The firm was founded in 1923 by the Labrum brothers from Warminster, England – the older brother Victor Charles Labrum (aka V.C. Labrum) was born in 1888 and served as manager of printing operations at Duddell Street for Kelly & Walsh before starting Ye Olde, which operated out of the basement of the China Building in Central in its early years. A director and life member of Kowloon Cricket Club, VC was described as “very popular in the colony” when he married Marjorie Webster. While VC handled the printing operations, the younger brother G.B. Labrum (married to Winifred Yeo in St Andrews Church in TST in 1925) handled business aspects and together they served in the Volunteer Defense Corps during the defense of Hong Kong in 1941 and were subsequently incarcerated in the Sham Shui Po camp by the Japanese. One of their employees Francis Braun was freed by the Japanese during the Occupation due to his Hungarian nationality (Hungary then under Nazi control) and Ye Olde was forced by the Japanese occupation force to print Japanese military notes under the management of Braun and two Japanese partners. After the War the Labrum brothers resumed control of Ye Olde with Braun as manager and after selling out to LPP, VC Labrum decided to retire in April 1952 to New Zealand and GB succeeded him as managing director of Ye Olde, which was moved to Printing House. Another form of expansion was property development and in 1951, LPP began building a six storey building on 1 Duddell Street. However, Foo Kam-shing (cousin of the famous diplomat Foo Ping-sheung and one time father in law of the late Legco councilor Dorothy Liu) sought an injunction in the High Court to block LPP from further construction claiming that the new building would obstruct the sunlight to the nearby property which he owned. After a lengthy trial, LPP won the lawsuit in August 1952 – a judgement that had significant implications for urban development in Hong Kong and the building was completed as Caxton House in 1953. In the fiscal year ending June 1952, LPP’s profits exceeded $1 mil for the first time at $1,126,219. In the fiscal year ending June 1954, profits rose to HK$1,366,121 but the core printing business was not doing as well as the previous year so most of the gains came from properties. The firm bought 20,000 square feet of land at 734 King’s Road, North Point and also gave stock dividend – 1 new share for every 4 shares. In the fiscal year ending June 1955, profits reached HK$1,399,944. The firm also successfully acquired Inland Lot 644 which comprised of 22 Ice House Street, the site of Union Hotel 如雲酒店, which was Matsubara Hotel 松原旅館 before Sep 1941 and damaged by a fire in 1952 ) and 13 Duddell Street and re-developed the site as Baskerville House. By the fiscal year ending June 1956, profits were HK$1,492,923 and in the next fiscal year ending June 1957, they reached HK$1,617,768 and assets reached HK$8,133,896 which included the 4 main properties that would form the core of LPP’s assets in the coming decades – Stanhope House in North Point and Baskerville House, Printing House and Caxton House on Duddell Street. Profits rose again to HK$1,718,270 in 1958 but dropped to HK$1,613,906 in 1959. In the summer of 1960, Lee went on a six month trip touring the Americas and also dropped off his youngest daughter Wai-fong at school in the US. To reflect its dual lines of business, the company was renamed Local Property and Printing Company Limited in June 1961. Since LPP was very profitable, there were no imminent needs to raise external funds for its operations. However, since Bradbury and another board member Cyril Chamberlain Blake (aka “C.C. Blake”) were both members of the Hong Kong Stock Exchange, the idea of public listing to enhance liquidity and provide a proper valuation was appealing to the firm’s board and LPP first applied for public listing of its shares on the Exchange in 1957. The application however dragged on for several years due to a “personality clash” with the Stock Exchange Committee according to the biography of the stock market guru Noel Croucher and it was LPP director Peter Alan Lee Vine (1921-2005, Deacons partner) who enlisted the help of Croucher to smooth things out and finally succeeded in listing on the Exchange in September 1961. Two new board members who joined as part of the listing were the then 39 year old Robert Steer Huthart, the general manager of Lane Crawford and George Maurice Davreux, the manager and secretary of Humphreys Estate. In November 1962, 5 LPP workers who lived in Kowloon City tenements won the million dollar Jockey Club lottery ticket (ma piu) with a wager of 2 HK dollars. The same year, LPP redeveloped Stanhope House into a 7 storey industrial building with the ground floor being leased to Jebsen Motors as a Volkswagen dealership – unfortunately within a year one of the tenants had a fire which required ten fire engines to put out. In 1972 Herald Electronics had another fire . 1960s was a turbulent time politically but a strong period of economic growth. LPP’s profits has grown to HK$2,857,323 and its total assets exceeded $18 million by 1967, although printing operations profits dropped 10 percent over the prior year as costs increased while business was slow. To put its 1967 profits into perspective, it was higher than some of the leading Chinese manufacturers at the time such as Amoy Canning, Nanyang Cotton Mills, Kwong Sang Hong and Textile Alliance although its asset base was smaller. In 1970 Bradbury passed away leaving his estate to the Bradbury Trust which supports many charitable causes in Hong Kong to this day. His position of LPP chairman was assumed by Huthart who remained a director until 2003, serving a total of 42 years. On May 20 1974, Lee Yat-ngok passed away in his home at 6 Cornwall Road in Kowloon Tong. Consistent with his frugality in life, his funeral was a private affair at home after which he was cremated, although the HKPA and HSA did hold memorial services in his honor. Although Lee was physically in Hong Kong, Hok Shan was never far from his mind. In addition to employing many Hok Shan natives at LPP, he was also active with the Hong Kong Hok Shan Merchants Association, which he helped to expand as Hok Shan Association after the war and served as its chairman for 24 years between 1946 and 1970. In 1938, together with HSA chairman Hau Sau-nam (侯壽南, maternal uncle of Li Koon-chun and Li Tse-fong, the founders of the Bank of East Asia), he helped organize the Hok Shan Relief Committee as the Japanese invaded Hok Shan and during the Japanese occupation, helped natives relocate back to Hok Shan. In 1949 when the Communists took over Hok Shan, he wrote a letter on behalf of the Hok Shan Association to the new Hok Shan county government expressing the support of the local Hokshan community. After the Johnston Road building was completed, he helped build the Hok Shan School in the Wah Fu public housing estate in Aberdeen and recruited fellow Hok Shan native Dr. Catherine Woo, the longtime headmistress of St Paul’s Co-Ed, as its supervisor. After China opened up in 1978, his family returned to Hok Shan and donated a wing in the local hospital and 2 school halls, in addition to paving roads and establishing water supply in his native village of Pun Kwong (蟠光村) in his honor. Lee Yat Ngok (fourth from the left in the front row) with the key members of Hok Shan Association: Ip Lan Chuen (founder of CMA, front row centre), Loke Yung Cheong (grandson of Loke Yew, fourth from the right in the front row), Li Lansang (owner of Kowloon Dairy, third from the left in the front row). Source: Hok Shan Association. Lee had one son (Lee Fai, who predeceased him) and three daughters. His eldest daughter Lee Pui-fong (李佩芳) married Wong Shiu-keung (黃肇強), a nephew of Parkin Wong, the comprador of American Express while his second daughter Lee Kwai-fong (李桂芳) married Leung Ting-sun (梁廷燊) in 1958. The first chief to enforce the enrollment of female students in Hok Shan back in 1920s, Lee Yat-ngok also installed his daughter Kwai-fong as the Secretary of LPP early on and she was one of two female Secretaries of public companies in the 1960s, the other being Grace Young of HK & Yaumati Ferry. 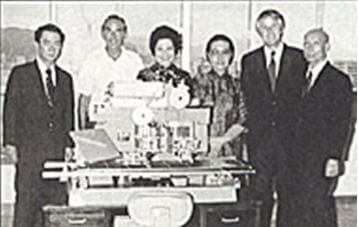 After Lee Yat-ngok’s death, his two sons in law Leung and Wong took over the management of LPP and in 1978, privatized the printing operations while the listed entity was renamed “Local Property Co Ltd”. In 1982, Local Property invested $50m to redevelop Caxton House and also $30m to re-develop Stanhope House. It also redeveloped Lee’s former residence at 6 Cornwall Road as Lockoo Garden. In 1988, the family decided to sell its majority stake at Local Property to the Hang Lung Group while continuing to operate LPP and Ye Olde Printerie to this day. Leung Ting Sun passed away in 1995 and was succeeded by his son Wayne Leung (梁偉賢), the current head of the firm which remains a leading printer in Hong Kong. Lee Yat-ngok’s brother in law Yick Ching-chung (易靜中1915-89, brother of Yick Tak-hing 易德馨, founder of Dickson Construction) was another Hokshan native who was active in the HK printing industry. A graduate of Hosei University in Japan, Yick was also known for his Chinese calligraphy and poetry. 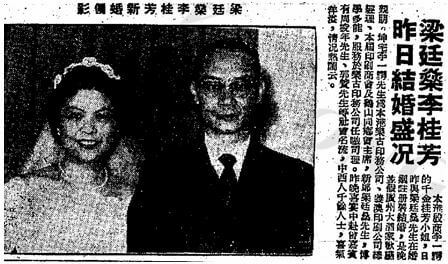 Yick’s daughter married Lee’s nephew Lee Shun-hay (李純熙), who ran Ye Olde and serves as honorary advisor to HKPA and president of HKHSA. This article was first posted on 1st August 2016. Other notable Hok Shan natives in the HK printing industry include Lui Cheuk-ping(呂焯平), founder of Paramount Printing (now owned by Next Media); Yam Cheung-hung(任昌洪), founder of Hung Hing Printing (listed); Fung Hok-hung(馮學洪), founder of the Leo Paper/Astros Printing Group; Fung Kwong-fat(馮廣發), founder of Climax International (formerly listed and known for its Easyfil photo albums); Fung Yip-cheong(馮業昌), founder of Ching Luen Printing and former Legco Councillor Alex Wu Shu-chih(吳樹熾), founder of Dai Nippon Printing Hong Kong. “Market for American machinery in the Canton Market”, Western Machinery World, Volume 12, 1921.